Trofeo Chain & Sprocket Kits. Silent Chain & Sprocket Kits. Quiet Chain & Sprocket Kits. DID Chain & Sprocket Kits. Ognibene Chain & Sprocket Kits. AFAM Chain & Sprocket Kits. Triumph 955i Daytona 99-00 DID Silent Chain And Sprocket Kit + Tool. Note: The sprockets in this kit may vary from the picture, but will be correct for the specified bike. 1 DID VX Super Heavy Duty Gold X-Ring Chain (Standard length). 1 Ognibene'Silent' Steel Rear Sprocket (Standard size). 1 Ognibene'Silent' Steel Front Sprocket (Standard size). 1 Ognibene Quality Chain Joining Tool. Our kits come with high quality, branded sprockets to match the chain, resulting in much better lifespan. DID is the biggest name in the world of motorcycle chains. 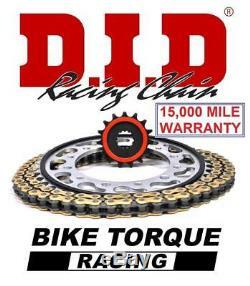 Manufactured in Japan to the highest standards, DID chains are fitted as standard original equipment by most of the leading motorcycle manufacturers. The chain in this kit is the VX Super Heavy Duty Gold X-Ring chain, manufactured using high quality components and gold coloured side plates. This is a very high quality, strong chain that provides excellent longevity. From new most motorcycles are fitted with a rubber damper mounted to the front sprocket, which significantly reduces transmission noise from the chain passing over the front sprocket whilst riding. Ognibene have developed this range of high quality'Silent' sprockets that feature a rubber damper on BOTH the front and the rear sprockets. The sprockets themselves are manufactured in a strictly quality controlled environment to ensure that they meet the demands of the modern motorcyclist. The Ognibene chain riveting tool is a fantastic, simple tool that allows you to easily join your motorcycle chain with minimum fuss. We can supply most kits with alternative gearing and can even supply coloured chains. Bike Torque Racing is a leading UK importer and trade distributor of high quality products for motorcycles. Established in 1994, we distribute many world class brands including Brembo brakes, Afam chains and sprockets, DID Chain, Domino products, Ognibene chains, OZ wheels, Woodcraft products, NRC engine covers, Zard Exhausts, Matris Suspension Products, Surflex clutches, Shido batteries, Pipercross air filters and much more. We are based in Frome in Somerset and we are always happy to help, if you can't find what you want in our listings please just give us a ring on our telephone number at the top of our listing. Please note the typical lead time for special orders from Italy is approx 4 weeks, but this can be longer at the start of the racing season or during public holidays like August, when Italian businesses close for the summer holiday. Some parts and products are supplied with technical specifications and fitting instructions and some not. It is most important that all persons or companies carrying out fitting work should read all such information and be competent and knowledgeable in the task they are undertaking. The fitting of some parts may necessitate the modification of other parts and/or the replacement or removal of other parts. It is the responsibility of the purchaser to ensure the correct parts are fitted and that any necessary modifications are carried out competently. If you are in any doubt please consult a professional mechanic or engineer. It is expressly your own responsibility to ensure that all parts are fitted correctly and that all safety measures have been taken. Always refer to the manufacturers workshop manual. This listing is currently undergoing maintenance, we apologise for any inconvenience caused. The item "Triumph 955i Daytona 99-00 DID Silent Chain And Sprocket Kit + Tool" is in sale since Friday, June 16, 2017. This item is in the category "Vehicle Parts & Accessories\Motorcycle Parts\Drivetrain & Transmission\Chains & Sprockets". The seller is "biketorqueracing" and is located in UK. This item can be shipped to all countries in Europe, United States, Canada, Australia.